In the second of our popular open water swimming events, on Sunday May the 12th we combine a screening of The Ponds with an exhibition of early 20th century photographs of the very pools that this charming film depicts. Before and after the film we have talks from Emma Pusill and John Myatt, two engaging local open water swimmers with quite different stories to tell. In ‘Travels with My Towel’, Emma will take you on a tour of some of the pools she visited when researching her recently completed book. The Lido Guide (featuring Clevedon Marine Lake), is a practical, beautiful and inspiring guide to the open air pools of the UK & Channel Islands. In the second talk, in his inimitable style, John Myatt discusses swimming 1km in zero degree water, unconventional Russian recovery techniques, and how the right mind-set led him to his rightful place on the podium at the World Ice Swimming Championships in Murmansk this year. Nancy Farmer will be selling her exquisite swimming caps, calendars and other works of wet art, and the bar (which sells cake, naturally), will be open before, during and after the event. This event is part of our Curzon Roof Festival, a series of events with the aim of raising funds to repair our leaky roof and save this wonderful cinema. 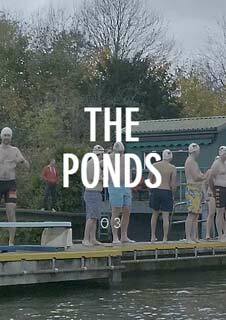 The Ponds is a film about the brilliant community of outdoor swimming. In a world of constant flux and chaos, it’s almost a shock to discover some experiences remain natural, unhurried and unchanged. In the middle of metropolitan London lies Hampstead Heath, 320 hectares of forest, parkland, wildlife plus three swimming ponds. People swim in them all year round, whatever the weather, just as they did in the time of Keats and Constable, and our cameras filmed them over 12 months as they swam, laughed, sang, complained, ruminated, philosophised and simply sought respite from all that life threw at them.